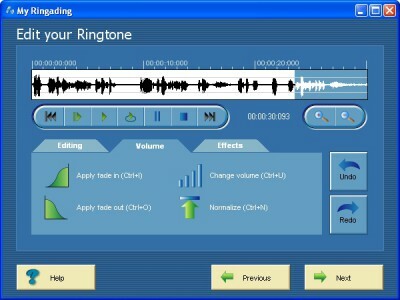 My Ringading 1.0 free download. Are you tired of the limited selection of ringtones on your cell phone? With My Ringading, you can create truly unique ringtones that stand out in the crowd. Simply put your favorite CD in the CD-drive, import a track, edit and transfer it to your cell phone using the WAP browser or Bluetooth, Infrared or cable connections. You can of course also record ringtones using the soundcard on your computer.